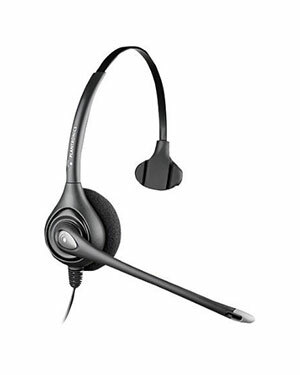 Working with the latest in wideband VoIP technology, the Plantronics HW251N-USB SupraPlus Wideband headset delivers the highest level of audio performance even in noisy environments. The Plantronics HW251N-USB SupraPlus Wideband helps overcome the challenges posed by traditional technology, delivering heightened speech clarity and life-like fidelity. With the Plantronics HW251N-USB, users will experience greater satisfaction through enhanced intelligibility and reduced miscommunication. A Noise-Canceling microphone filters out excessive background sound to further heighten call clarity. The Plantronics HW251N-USB was designed for over-the-head comfort, the Plantronics HW251N-USB SupraPlus Wideband lets users choose between experiencing total-focus sound reduction (Binaural design) or conversing easily with coworkers without removing the headset (Monaural design).